Your temporomandibular joint (TMJ) is one of the most important joints in your body, allowing you to speak and chew food freely. But for many Americans, dysfunction of this joint can cause pain, discomfort, swelling, and a bevy of other ailments. 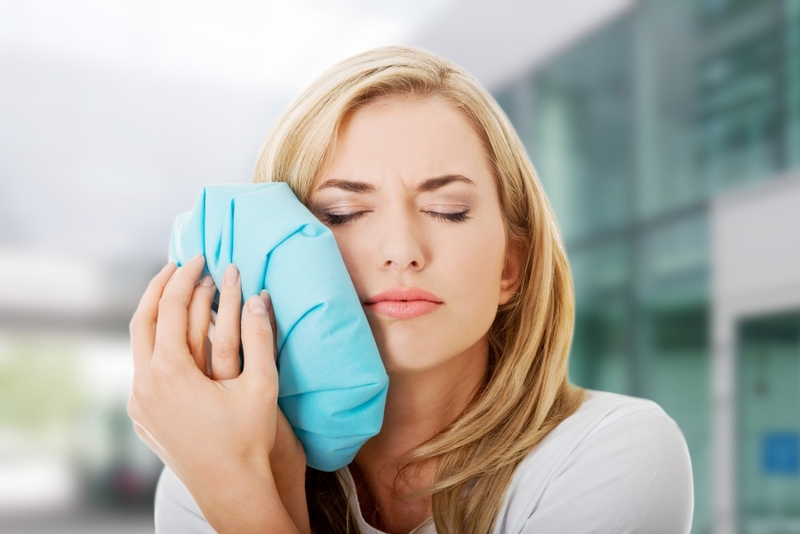 In this blog, the Gaithersburg dentists at Clopper’s Mill Dental Care will help you understand Temporomandibular Disorders (TMD)—which are commonly misnamed as TMJ—and provide you with the most common methods for treatment and pain relief. TMD can also cause toothaches, headaches, shoulder pain, and ringing in the ears. While there are quite a few medical procedures that can alleviate the symptoms of TMD, there are also some home remedies and good practices that can relieve pain and discomfort caused by the disorder. If your TMD is caused by jaw clenching or teeth grinding during sleep, getting a mouthguard from your dentist or your local pharmacy can protect the enamel of your teeth, and release some of the tension that can build up during the night. Munching on hard foods will only increase the pain and pressure of TMD—sticking to foods like soup, eggs, soft meats, yogurt, mashed potatoes, and pasta dishes will help you avoid extreme jaw movements, and will decrease the chance of friction between your TMJ and the surrounding socket. Keep your mouth shut (literally). Extreme jaw movements like yawning, intense chewing, and shouting can cause sharp pains and increase TMD swelling—mainly because they increase friction between the TMD and its socket. Avoid these extreme movements as much as possible to reduce TMD symptoms. Constant contact between your top and bottom teeth can increase pressure, pain, and swelling. Keeping your teeth slightly apart, or placing your tongue between your teeth, will relieve these symptoms and prevent you from involuntarily clenching your jaw and grinding your teeth during the day. As one of of the most effective pain-relief treatments for TMD, TENS uses low-power electrical currents to relax facial muscles and jaw joints. This can be done with at-home or dentist office treatments. Radio waves directed at the TMJ will increase blood flow and relieve pain. Using an arthroscope (basically a flashlight/camera), an oral surgeon will administer anesthesia, make a small incision behind the ear, and insert the arthroscope, allowing them to see inside of the joint. The oral surgeon will then diagnose issues with the joint, and will remove inflamed tissue, remove excess bone, or realign the disc or the joint. Using general anesthesia, an oral surgeon inserts a needle into the joint to wash out the area, and may use special tools to remove damaged tissue in order to dislodge a “stuck” TMJ or disc. Generally used in circumstance where the patient’s TMJ is affected by tumors or bone chips, an oral surgeon will open up the joint area for a better view and easier access to the joint. This procedure takes longer to heal from, but is perhaps the most thorough and effective way to fix TMD problems. If you’re experience any sort of TMD symptoms, it’s important to see your dentist as soon as possible. That’s where Clopper’s Mill Dental Care can help. With a team of seasoned dentists and oral surgeons on staff, we’re happy to help you with TMD problems, big or small. Schedule an appointment today.